Lyme disease is rarely fatal, but it can lead to a lifetime of suffering. But when compared to a virulent virus like Ebola, Borrelia (the bacteria that causes Lyme disease) seems relatively benign. Ebola spreads like wildfire and leaves a path of devastation in its wake. Most people who are exposed get sick and either die or recover completely. The disease caused by ebola virus is readily recognizable and is easy to diagnose. In contrast, the manifestations of Lyme disease are highly variable. It is very difficult to diagnose and even harder to adequately treat. Wherever you find ticks, you will find Lyme disease. As long as ticks exist, Lyme disease (and other tick-borne illnesses) will never be controlled. Lethal microbes like Ebola get lots of attention because they are so highly visible. Right at this moment, more minds worldwide are focused on finding solutions for Ebola than all the minds who have ever researched Lyme disease. You can be sure that solutions will be found and the Ebola epidemic in West Africa will ultimately be controlled. 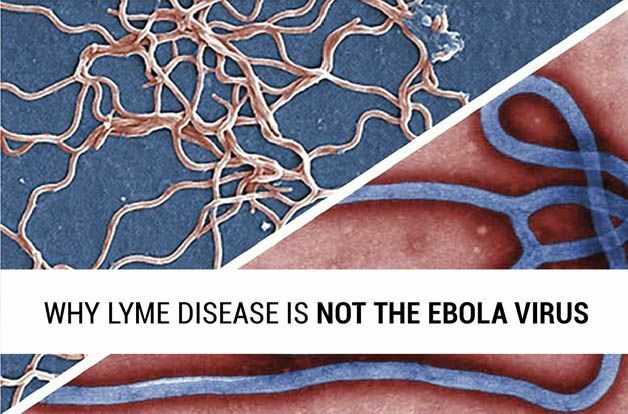 Two such polar-opposite diseases as Ebola and Lyme disease should certainly be managed differently. Ebola must be treated like the wildfire that it is. Quarantine is very effective for such highly visible infectious diseases. This alone will contain the epidemic, but not before many will die. Ultimately, drugs and/or vaccines will become available; highly virulent microbes always have an Achilles heel that responds to targeted pharmaceutical therapy. An infection with borrelia, however, is more like being smothered slowly rather than being scorched by fire. The standard “contain and destroy” approach used for highly virulent microbes simply doesn’t apply. Once the bacteria is established deeply in tissues, short-term antibiotic therapy has little value. Long-term use of antibiotics can result in cure, but usually not before side effects limit use of the drugs or antibiotic resistance occurs. In other words, not that often. To overcome chronic Lyme disease, a therapy must be chosen that matches the life cycle of the microbe. Rather than jumping from host to host like ebola virus, borrelia plays a slow waiting game. Its only reason for existence is waiting for another tick to arrive to complete the life cycle. To do that it must evade the immune system of the host and steal enough resources to survive. Because it is so much less virulent than a microbe like ebola virus, the immune system sees it more as a nuisance than a lethal threat. Therefore, the most effective therapy would be one that both strengthens immune function and slowly wears down the stealth microbes at the same time. This is why herbal therapy makes a lot of sense for naturally treating Lyme disease. There are many medicinal herbs that have been found to have antimicrobial activity against borrelia and other stealth microbes. The herbs are certainly not as potent as a synthetic antibiotic, but because herbs are so well tolerated by most people, they can be taken for extended periods of time (years), and are ideal for slowly eradicating the microbes. Herbs also offer potent anti-inflammatory properties and enhance immune function. When combined with a healthful diet, low stress, and a healing environment, herbal therapy can be quite powerful, especially for chronically debilitating conditions like Lyme disease. For an in-depth discussion on the role that low-virulence microbes play in chronic diseases such as Lyme disease and Chronic Immune Dysfunction, check out Unlocking Lyme or read about Dr. Rawls’ Lyme disease journey. 2. National Geographic 11/2011, Iceman Unfrozen. 3. Virulence defines the propensity of a microbe to infect and cause disease. 4. “Ebola virus disease Fact sheet N°103”. World Health Organization. September 2014.